I figured some of you might be getting sick of my vegetarian recipes and want one with some meat. Ask and you shall receive. I posted this picture on Instagram and got an overwhelming response of people wanting the recipe. This recipe is so easy- well it was easy for me because Matt did all the prep work and cooking. These burgers were magical, maybe because I hadn't had red meat in two weeks but either way they were good. A few notes we were lazy and used 1000 Island Dressing instead of making our own Special Sauce. We decided at about 5 that night to make the Big Macs and that didn't give us enough time to let the Special Sauce sit for hours. It was good with 1000 Island but I imagine it is even better with the homemade sauce, I included the recipe below. We tried to cut and recreate everything else just like McDonalds. Finely diced onion and Shredded Iceberg lettuce are key. As for pickles we found all the pre-sliced jarred kinds tasted processed and funny so we bought the Boars Head Pickle Halves and then sliced them ourselves as thinly as we could, they worked out perfectly. 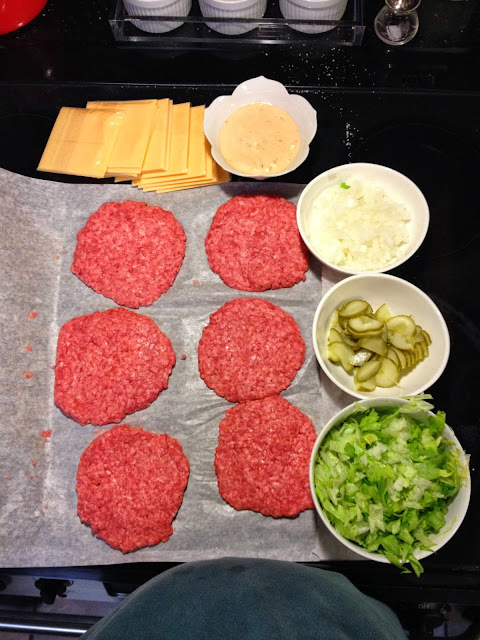 Shape meat into balls then flatten into thin flat patties- 2 patties per burger. Salt and pepper each side of the patties. Try not to mess too much with the patties while you flatten them it will make them tough. Lay them on parchment paper after shaping so they are easy to remove and get to grill. Heat grill cook burgers about 10 minutes 5 on each side or until cooked thru. Take off grill and top each patty with a slice of American Cheese. Layer special sauce. lettuce, onions and pickles and first burger patty on bun. Place middle bun on and repeat layer process. Add next patty and top bun. combine all ingredients in a bowl and stir well to combine, Place in a covered container and refrigerate overnight or at least a few hours for flavors to combine. Ohhh this sounds amazing! 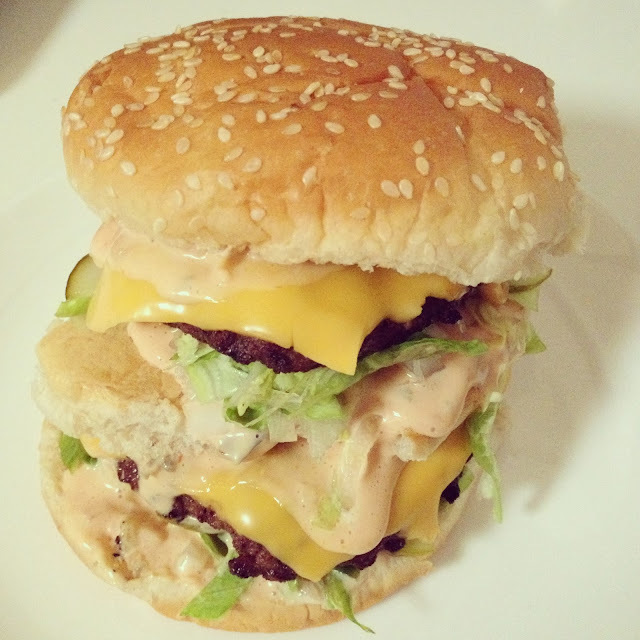 I secretly love indulging in a Big Mac every once in a while, this is such a perfect (non processed) alternative! Can't wait to try. Yum!! Have you tried the homemade chick fil a sandwich? So goooood! Wow! That looks unbelievable! I'm going to be thinking about this all day!!! Guess what i'm eating tonight! Wow!!! Awesome idea and recipe! Okay, I don't eat McDonalds and I'm sad to say I've never had a Big Mac but these look delicious!! I will have to try the homemade version! Looks delish! On another completely unrelated note, swing sweaters are an extra 40% off today and free shipping! Well everything on sale is an extra 40% but I just got two sweaters for the price of one! I've never had a Big Mac either but if they look like this I could definitely wrap my head around that. Going to need to make this asap! Mmmmm Big Mac....one of my biggest cravings so far this pregnancy. Pinning this to my Dinners Board. by far my biggest pregnancy craving was special sauce! yum yum! This Bigmac looks even better than the real one! SO glad I saw this, on my to do list for dinner- it's almost embarrassing how much I love Big Mac's!